We have received a letter from a corres- pondent in Dundee, N. Y., in reference to the article on the above subject, which appeared in our issue of the 13th of last month (page 179). In that article it was stated that the fly-wheel of a grist mill ought to be made " sufficiently large and heavy, so that its momentum shall exceed that of all the stones combined," and if so made, backlash would be prevented. Our present correspondent states that ho has built twenty steam flouring mills within the last twelve years, and in no one instance has he witnessed a steady motion produced from a single engine where the periphery of the fly-wheel did not exceed in momentum that of the stones, by one-fifth; and he is now building mills with fly-wheels, the momentum of which exceeds that of the stones in the ratio of seven to four, and ho finds that this is not too much to make the motion regular. 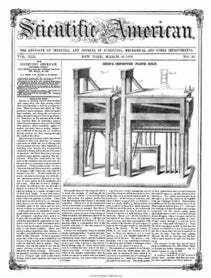 He agrees with our former correspondent that short-stroke, quick-running steam engines are the best for grinding grain ; and those which he now puts up, make from 140 to 150 revolutions per minute, and they do much better than slow-running engines.